Allowing the steaks to warm before cooking is one of the most important preparation steps. Set the steaks out at room temperature for 30 minutes. Rub with olive oil, and season with salt and fresh ground pepper. In the meantime, prepare your fire using charcoal, or bring your gas grill to high heat. In a medium saucepan, over moderate heat, combine the sunchokes and cream and bring to a boil. Lower the heat to a simmer and continue simmering until the sunchokes are tender. Transfer the sunchokes to a blender or food processor, reserving the cooking liquid. Process, adding the liquid as necessary, until completely smooth. Season with salt and pepper. Transfer the purée to a bowl and keep warm. You can cook the Romanesco and pearl onions earlier in the day so you can focus on grilling the cowboy steak. Preheat your oven to 400°F. In a large mixing bowl, add your Romanesco florets, garlic cloves, fresh thyme sprigs, olive oil, salt and pepper. Mix to coat. Lay the florets out onto a baking pan and cook for 10 minutes, or until tender and partially caramelized. Place a medium-sized, oven-safe sauté pan on high heat. The pearl onions will also go into the oven, so consider space when arranging oven racks. Add the grapeseed oil and pearl onions. Turn the heat down to medium-high and continue to cook the onions for five minutes. Add salt and pepper, to taste. Place the sauté pan in the oven for five-to-ten minutes, or until the onions are tender. 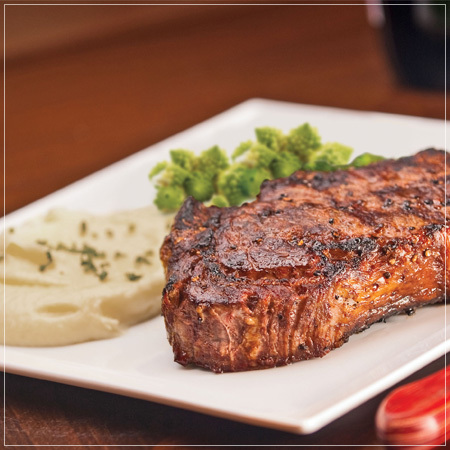 You want to have your room-temperature steak oiled, seasoned and ready to go. Grill your cowboy steaks five minutes on each side. Finish the steaks using indirect heat for another 15 minutes for medium rare, turning occasionally. Using a meat thermometer, check that the inside temperature reads 125° to 130°F. Spread the sunchoke purée on a warm serving platter. Place the Romanesco florets and pearl onions on the top of the purée, removing the thyme stems and garlic pieces. Top with the steaks and a slice of truffle butter on each steak. Serve family-style and enjoy.